Almost every medical shows out there have that magical thing called "Defibrillator". 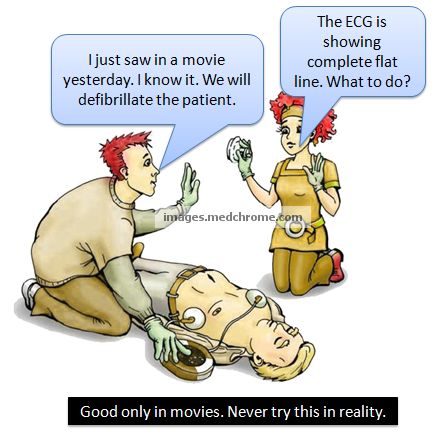 One grave fallacy in such TV shows is the use of defibrillator (shock) in patients with asystole (flat ECG line). The ACLS has classified asystole as a non-shockable rhythm. This is because defibrillation in asystole is not only fruitless, but also detrimental, eliminating any possibility of recovering a rhythm. Asystole following electrical defibrillation has an even worse outcome than that in a patient whose first documented rhythm was asystole. But, remember that fine ventricular fibrillation may look like asystole and in such cases asystole needs to be confirmed in several leads. Asystole is primarily treated with CPR (Cardiopulmonary Resuscutation) combined with an intravenous vasopressor such as epinephrine (adrenaline).